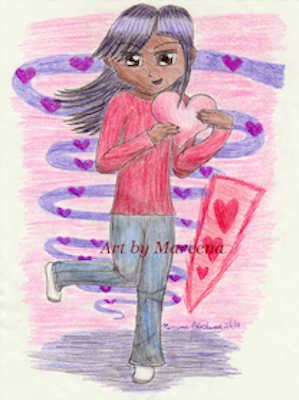 This anime art Valentine’s Day colored pencil drawing depicts an African American girl with large brown eyes and dark flowing hair carrying a red valentine heart. She wears a long sleeved red shirt, blue jeans, and white socks with gray toes. Head high swirled ribbon floats in the background along with red penciled back splash. A slew of violet hearts float inside the ribbon from top to bottom of the soft purple swirl. Adorn rooms with this beautiful piece or send it in card form. Prints are available in two sizes as outlined below. Inside cards may be blank to use as note cards or to add your own wording for occasions of your choice; or the card may include buyer requested content. ALL ORDERS: Allow 5 to 7 days for delivery.